Vibratory finishing machines use the principle of centrifugal force to cause vibrations to the work bowl thereby processing the components to the desired finish. The equipment comprises of a work bowl mounted on a rigid base frame. 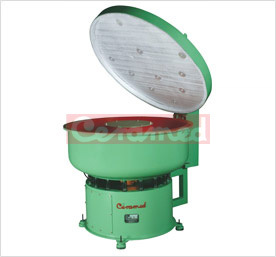 Ceramed’s Vibro finishing machine uses a powerful imported vibratory motor, made of special grade casting, and heavy duty spherical roller bearings. Springs are provided between the work bowl and base frame. 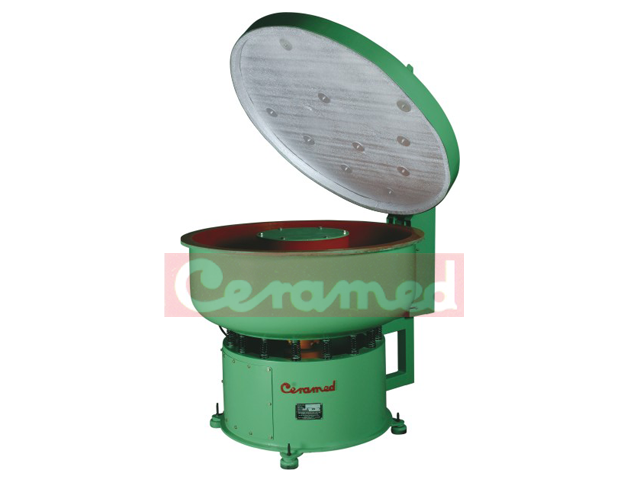 During operation, a mass of components along with a suitable ceramic media and chemical compound is introduced into the work bowl, the whole mixture rotates inside the bowl in a spiral and rotary motion causing the ceramic media to rub against the components continuously thus imparting the desired finish to the components. Heavy duty flange type vibratory motor with adjustable amplitude for fast & effective process. Hot poured polyurethane lining with 12-16mm average thickness and the hardness approximately 75-80 shore A for long life. Raw materials and components used and quality standards employed for manufacture, ensure trouble free performance. The springs are specially designed to withstand heavy load and in the manner that they deliver spiral and rotary motion of the components and media in the bowl. Standard electrical switch gear items with safety features are provided along with the supply. The machine is mounted on anti-vibration pads. Only High tensile SS bolts are used.